Somewhere, in the depths of my imagination, I picture Yu Darvish, Brandon Morrow, and Kris Bryant riding majestic white horses into Chicago on September 1, leading the team triumphantly down the stretch and straight through the playoffs. Will it happen exactly like that? Yeah, probably. But before I order a bunch of horse-sized poop bags for the streets around Wrigley Field, let’s check in on the latest injury updates, eh? Yeah, that’s smart. The Cubs have been without Darvish since the end of May, as he’s dealt primarily with right tricep tendinitis, but the time to return could finally be coming for the big right-hander. “He looked totally involved,” manager Joe Maddon said about Darvish’s three-inning, 50-pitch simulated game on Tuesday. “He was absolutely competing out there, that’s the word I used. He got upset with himself when he spiked one fastball, which I kind of liked. He looked really good and was not holding back.” According to Maddon and Theo Epstein, Tuesday’s simulated game was yet another success for the Darvish, who’s next move should/will probably be a rehab start in the Minor Leagues. But where? when? Well, it’s worth pointing out that a rehab start will be the next move only if Darvish wakes up today with his arm feeling good. So keep an eye out for that. If he doesn’t feel right, things will change. HOWEVA, because I generally expect that to be the case, I’m comfortable getting your hopes up with the following: Sources have told Bruce Levine that Darvish’s first rehab start will be this Sunday in South Bend. And that makes plenty of sense. The SB Cubs are nearby and playing at home on Sunday, before heading out on the road on Tuesday. Fortunately, they’re only on the road for a short time and return on Friday, which would actually be regular rest for Darvish, if he were to make a second rehab start there on the 24th. The bad news is that given how long he’s been out, three rehab starts isn’t out of the question for Darvish. The good news is that the schedule keeps working out in his favor. 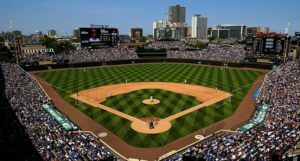 Five days (the 29th) after that theoretical second rehab start, the SB Cubs are once again at home, where Darvish could appear for the third and final time before finally rejoining his team for all of September. The timing and geography really couldn’t work out much better than that, so take solace in that. Here’s hoping that Darvish, who is, in Epstein’s words, “on a mission to come back and help this team,” feels good today. In a perfect world, Yu Darvish could throw again on Aug. 19, Aug. 24 and Aug. 29 and then be ready to join the #Cubs right at the start of September, Jim Hickey says. Hickey was really encouraged by Darvish's simulated game yesterday. Kris Bryant (left shoulder inflammation, two stints on the DL) took ground balls on the field yesterday, one of which was actually a live grounder during Darvish’s simulated game (a crossover episode!). Sadly, unlike Darvish, there appears to be no timetable for Bryant’s return to the big leagues just yet, but there is some good news to share on that front nonetheless. Theo Epstein didn’t want to speak for Bryant, but did seem to believe that the third baseman is “pain free at this point” and simply needs to ramp back up to full-game intensity with his swings. I’m reluctant to read too much into what were ultimately very short comments, but I did get the sense that we could see some batting practice swings from Bryant soon. And unlike Darvish, I don’t think he’d need quite as much time on a Minor League rehab assignment. So stay tuned. Things will probably move more quickly for Bryant once they get going. Brandon Morrow leaves us with very little to update. Joe Maddon suggested that “he’s feeling a little bit better,” but quickly added that he didn’t have a conclusive read on that or anything else to update. 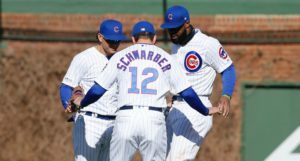 The Cubs bullpen has been fine without Morrow, and probably could make it the rest of the season without him. BUT, he’s pretty irreplaceable in the postseason, so I’m really hoping he comes back with a full month to get back up to speed and ready to dominate in October. Brandon Morrow's progress has been minimal, Jim Hickey says, but the positive news is once he's feeling good, the process to him working up to fill his 1-inning role doesn't take long. And finally, Brian Duensing. Duensing (left shoulder inflammation), was playing catch from 105 feet yesterday and is planning on throwing a bullpen session by the end of the Cubs next road trip (August 23), according to Carrie Muskat. 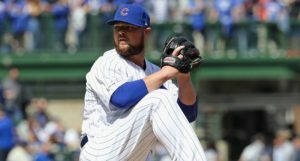 The Cubs left-hander received a cortisone shot in his shoulder to help with the pain and inflammation, which was so bad, he claims, it was pretty directly affecting his performance: “It was so sore that I was trying to find other ways to create velocity and angles, and then you get into bad habits,” he said. “Everyone walks guys, but I don’t walk guys like that. Obviously, something was going on. I couldn’t repeat my delivery and I created all these bad habits.” Hopefully, as a pain free reliever, Duensing can go back to his usual velocities and angles, eliminate the walks, and help the Cubs down the stretch.